Chanelling lace designer Isabella Catanea Parasole | Is This Mutton? 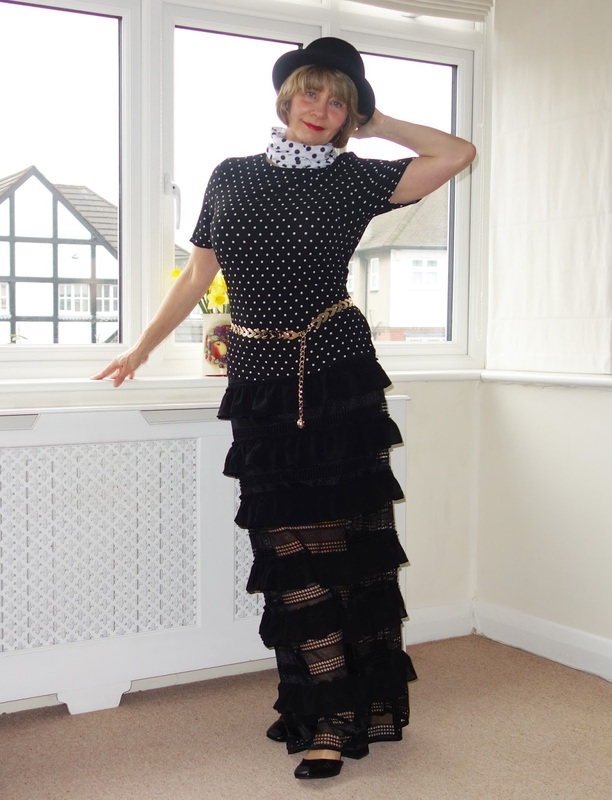 This month's SIA Challenge - Style Imitating Art - over at Jen's blog, Librarian for Life and Style, threw down the gauntlet to step out of my comfort zone and wear something a bit different. We're asked to channel the Italian lace designer and wood carver, Isabella Catanea Parasole (1565-1625). She was the first lace designer to create a lace instruction manual for women, Her designs include some circular lace, so I was looking for an outfit that included lace / circles / monochrome. I'm not really a "lacy person" in that I don't have any lace. But I found this excellent maxi skirt which I think could be loosely described as lacy. Goodness, I haven't worn a maxi skirt since I was 13 and they suddenly became all the rage! Doing some pattern mixing, I'm wearing polka dots too in the tie waist top (a great buy for women who need to define their waist). I added more polka dots with my Buff scarf. Remember - a Buff is not just for hiking. See my post here. The chain belt and hat added the finishing touches. I felt quite flamboyant in this outfit, as if I was off to a Mardi Gras. Click here to see how other bloggers interpreted the challenge. Skirt: White Cove at Asos; polka dot tie waist shell top, New Look at Asos; hat: old; belt: Madeleine (old); scarf: Buff, past season. For more Mutton follow me at Bloglovin to get an update on when new posts are published, and like my Facebook page where I also include curated articles you may be interested in. Sharing this post with Hat Attack #43 at Style Crone; Turning Heads Tuesday at Elegantly Dressed and Stylish; Style with a Smile at Style Splash; Fashion Should be Fun, hosted by Dawn Lucy; Fancy Friday Link Up hosted by Nancy of Nancy’s Fashion Style; Fabulous Friday at A Pocketful of Polka Dots. I love this interpretation of the category, Gail!!! Oh, my, how much do I love that skirt!? You look like the Tower of Pisa...in lace! How is it for walking? Do you have to take little steps? Well done on your interpretation of the theme. Oh so adorable! Love! Have a fun weekend & thanks for linking up! Thanks for linking up to Top of the World Style. Love the look and your unique poses.